Husband and wife Rob and Debbie Lane were close runners-up with 33 nett and Rajinder Sachdeva and playing partner Kwang Seok Kim came third with 33.875 nett. 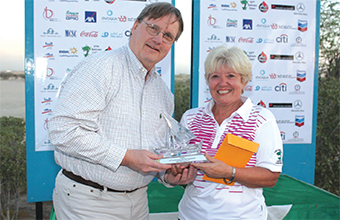 Nearest the pin side contests on holes 12 and 16 were won by Stewart Tankard and David Wales, respectively. Tankard and his regular playing partner Carter Alexander continue to lead the order of merit at the halfway mark with eight points. Ashley Price and Steve Middleton are in second place with seven overall. 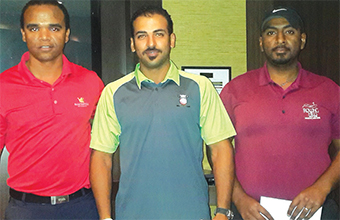 More than 15 golfers competed in the Pairs Scramble competition which was rounded off with a prize presentation in the Members’ Lounge where golf operations manager Sheldon Cameron presented the prizes. Results: 1st Isa Ebrahim & Ali Jassim (32.75 nett), 2nd Rob & Debbie Lane (33), 3rd Rajinder Sachdeva & Kwang Seok Kim (33.875), 4th Rob Mills & Alan Vandewater (34.5), 5th David & Dena Wales (34.875). 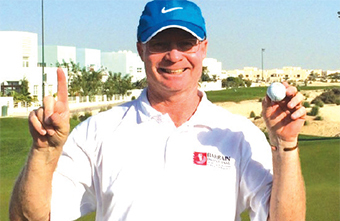 Nearest the Pins: Stewart Tankard (hole 12) & David Wales (hole 16).